Widespread misunderstanding and disconnection from farming amongst the general public has led to the common belief that poultry producers use growth hormones to make broilers grow faster and produce more meat. However, this is a myth. Scientists at the Department of Poultry Science in the Universidad Nacional Autonoma de Mexico led a review of the scientific reasons why poultry are not fed hormones. Growth hormones, such as oestrogen, progesterone and testosterone, occur naturally in animals and are essential for various physiological processes. However, synthetic versions of these hormones have also been used in cattle and sheep farming to increase growth rate and meat production efficiency. This practice is still allowed in the US and some other countries, but the use of hormones for any growth promotion purposes has been banned in the EU since 1981. 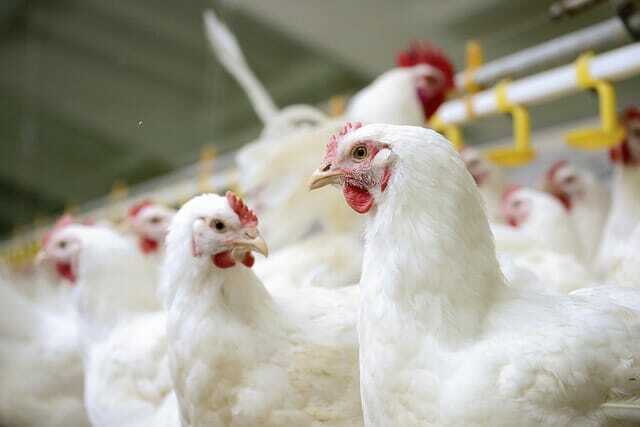 Growth hormone use in poultry farming has been banned in the US for more than 50 years, but a survey conducted last year found that 60 per cent of parents in the ‘Millenial’ generation were concerned about hormones and steroids in meat, poultry and dairy products. Adding to the confusion, many chicken retailers in the US put ‘raised without hormones’ onto the label, despite the fact that hormone addition is illegal. A survey this year found that over 60 per cent of US consumers find chicken labels and packaging confusing. Many other countries also ban growth hormones in poultry production, such as Australia and New Zealand. However, there are other reasons why poultry producers would not want to use growth hormones, even if it was legal and consumers were indifferent to their use. Yajaira Esquivel-Hernandez et al. felt the world needed a scientific explanation of the reasons why, which could be provided to professionals such as policy makers, health providers and food industry workers to address consumer concerns. Their work is published in the journal Trends in Food Science & Technology. So how practical would it be to use growth hormones in poultry production? The answer is, not very practical at all. Modern broiler chicken breeds are very fast-growing, reaching a 5-pound market weight in five weeks, compared with a 4-pound market weight in ten weeks that was achievable forty years ago. Hormones used in beef cattle production take the form of implanted pellets under the skin behind the ear of the animal, and can be implanted in beef cattle under one year old. The implants can last a long time, but it takes between 35 and 98 days after implantation to have an effect on muscle production. This means that hormones would simply not have time to work in broilers. Because the birds reach market weight before they reach sexual maturity, the hormones have no physiological effects. One example is with the hormone somatotropin. Yajaira Esquivel-Hernandez et al. described how a number of studies showed that there were only minor, transitory or absent growth responses after providing this hormone to chickens. Somatotropin normally works by increasing the production of proteins known as insulin-like growth factors, which then go on to stimulate growth, but this increase was not observed in chickens. In addition, scientists have showed that steroid hormones like oestrogen and androgens (male hormones like testosterone) do not stimulate growth in chickens either. Indeed, research suggests that androgens might even make rates of growth go down. Such studies essentially show why growth promoting hormones would not be useful in poultry production. The cost of growth hormones is also prohibitive to their use. Commercial poultry farmers have to maximise efficiency and product yield whilst minimising costs to remain profitable, and recoup the considerable investment of starting the farm. Yajaira Esquivel-Hernandez et al. showed that using hormones would not be feasible, as the cost of a single injection per chicken represents approximately 10 per cent of the overhead cost or approximately 1 per cent of the total production cost. If growth hormone implants were used in poultry, the estimated cost would be between $1.59 and $3.25 USD per chicken, which would be over ten-fold more expensive than the entire estimated total cost of vaccines, electricity and heating required per chicken ($0.13-0.23 USD/bird). Such costs would be too high for poultry producers to absorb, the retail price of the meat would have to rise to compensate, and poultry would then lose its status as the most economical meat for consumers. Coupled with the lack of efficacy, farmers would have very little incentive to purchase and use hormones, even if it was legal. So if consumers want to know why chickens are so much larger these days, they need to look to the great strides that have been made in poultry breeding, as well as nutrition, poultry health, processing and engineering, rather than growth hormones. Click here to read the full review paper. You may also be interested in the article on reaching genetic potential of modern poultry breeds in April's digital magazine from ThePoultrySite.